Asking customers explicitly to list their needs is often a fruitless exercise. Customers often have difficulty articulating their thoughts and behaviors out of context, and applying it to the problem you are trying to solve (vs what they are). Instead, your approach should be to observe them in action, and interview them individually, and in groups, to deduce a set of customer needs. In this part we look at the most efficient mechanisms of gathering this feedback via interview and focus groups. People don’t want to buy a quarter-inch drill. They want a quarter-inch hole. Well actually, no one really wants a “hole” per se, they want to hang a picture, or put up a shelf — but you get the idea. What we’re trying to ascertain are the core pains the customer wants solved, and focusing prematurely on solutions, can constrain the ultimate product service, such that you can misss creative opportunities to solve the real latent (unspoken) needs. 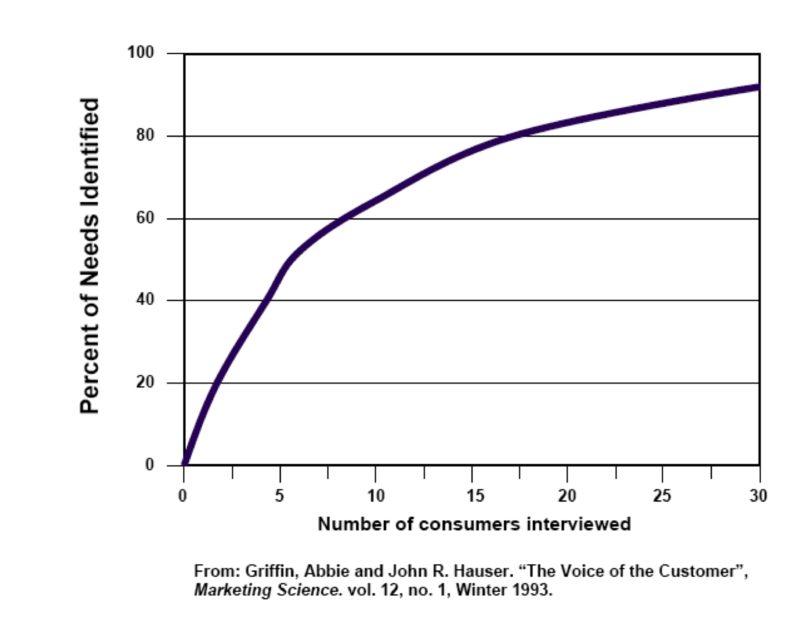 Customer interviews are one way to gather the relevant data. 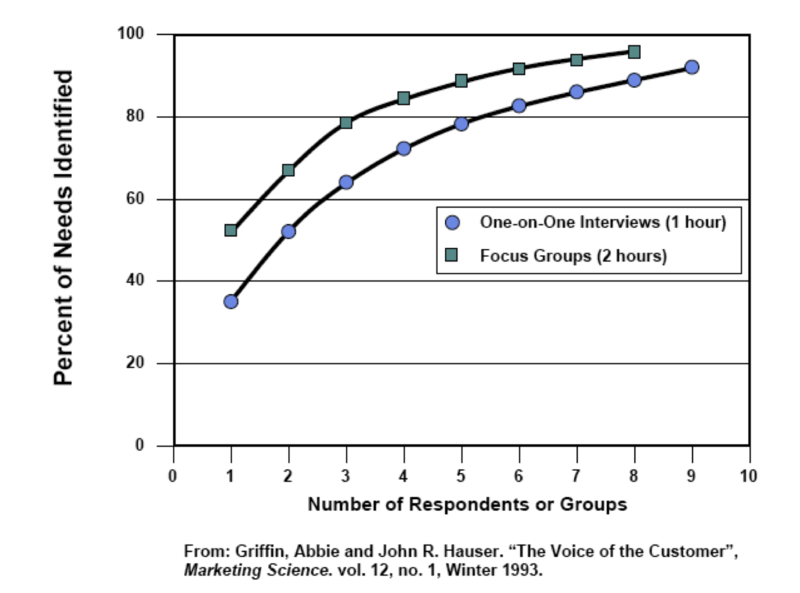 While the VOC model does not delve into interviewing techniques, the focus of their research was to look at how to efficiently gather customer needs using both techniques, by understanding the point of diminishing returns. In their experiments, the researchers conducted a number of two-hour focus groups, as well as one-hour interviews. Regardless of method, the goal was to ask customers about their real world experiences, and to compile a number of distinct “need statements”. The sessions were considered complete when interviewer felt that no new needs could be elicited from the customer(s) in the session. Since we’re often battling resource constraints, of time and money, it’s important to isolate the minimum effective number of interviews to isolate the bulk of the customer needs. Once again the VOC paper describes an experiment whereby 30 interviews were conducted by 7 analysts, and uncovered 220 needs. 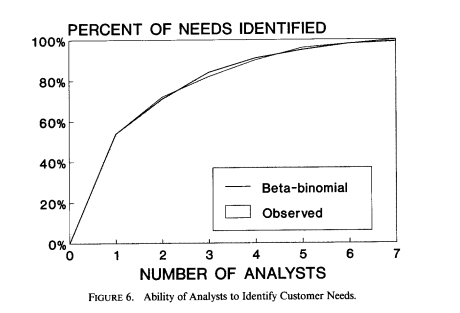 In looking at the results, they plotted the number of customer interviews vs. the % of unique needs identified in each session, and arrived at the following plot. So far in this series, we’ve covered the basics of the VOC model, and how to structure your data collection efforts. In the next post, we’ll look at, how we take all of the needs identified in this step and structure them into a logical framework. Have you ever considered VoC analytics for this stage? Some of our clients very effectively identified needs that are unmet by currently available products by processing very large volumes of unsolicited customer feedback.